Anna Maria Horner: A Quilt for Queensland Auction! 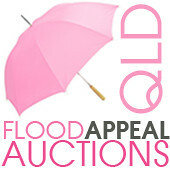 A Quilt for Queensland Auction! I won't even bother to describe the devastation in dear Queensland since the flooding except to say that I cannot even conceive of it. They need help, every form of help, money and prayers. Today I am offering this quilt that is dear to me up for auction (more written about it here). I designed the fabric, the quilt, and pieced, patched, hand quilted and bound every bit of it myself. In fact, much of it was even hand quilted on that amazing journey we took last year. So you can bet that blood, sweat and most definitely tears also inhabit this piece of work. But it still smells nice, promise. The quilt is made from my Gathering Flowers Quilt pattern in the Twin/Full size which is 72" x 90" and is backed entirely in the Square Dance Berry Voile. 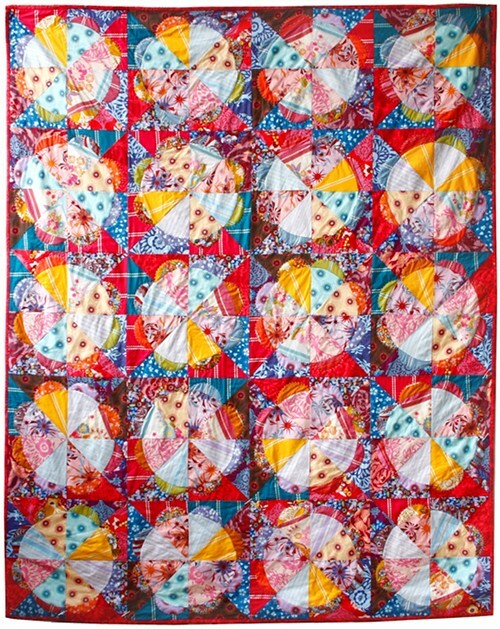 This quilt is a mix of cotton voile and cotton quilt weight fabrics. 1. Bidding starts at $100 US. 2. Place a bid by leaving a comment on this blog post with your bid amount. Please make sure that your bid is higher than the previous bidder. 3. Bid must be in whole dollar increments. 4. This auction is open to everyone in the world, and I will offer free shipping worldwide. 5. The auction begins now and will end at midnight on Monday, January 24, 2011. 6. At the close of the auction, I will contact the winner, so please leave your comment with a link to your email or blog. 7. The winning bidder will donate the amount of the bid directly to the Premier’s Flood Relief Appeal and send confirmed receipt of payment via email to sales@annamariahorner.com. Then we will ship this beautiful quilt to you! Happy Bidding! Be sure to see the master list of all the current auctions happening around blogland. EDITED TO ADD: Thanks to each of you for your generous bids, and most certainly to our winning bidder, Diane. I also want to thank Toni Coward so much for coordinating the auctions and making it so very easy for the rest of us. We often feel powerless. I particularly didn't imagine I would have the time to do anything to help as I am feeling behind with my own efforts for Tennessee Flood victims, however the mere mention of auction and her willingness to get the word out and provide a template made it so simple. Thank you! Diane I will get in touch! I'm sure I'll be outbid right away, but $125! $325 -- and I'll be sure to spread the word! $375, what a fantastic thing and such an amazing quilt!!! Love it to pieces!! WOW!!! Anna, this is unreal. Wow! I just wanted to say that I am an American mum, living in Australia now for 4 years, and believe me, we are all touched by the kindness that you are showing to all of us aussies here. God Bless you all!!! I'm from Australia and I just wanted to say thank you so much for supporting us in this time of need <3 these floods + the droughts we're living in is going to make for some hard times to come. Another Aussie here! I read your blog religiously and LOVE everything you do. I wish I could bid for this quilt, it is amazing. You are so generous! Thank you. I'm a beginner sewer, and an avid follower of your blog. Not big on writing comments but I did want to say that as an Australian living on the other side of the world your thoughtfulness, generosity and even the beauty of this quilt is so touching. God given gifts! I live in the state of Victoria where, though they aren't as devastating as Queensland floods, we are also affected by floods. The town I live is on major flood alert in the next few days. No danger but potential for damage and losses. Anyway what I wanted to say was that in preparing (placing valuables up high) I've made sure my Nan's 1970's sewing machine, favourite fabric (your fabric a must! ), and my half made Good Folks quilt are hopefully safe up on a high shelf. I hope that doesn't seem too shallow when others have lost so much.... Thanks Anna Maria! Another Aussie, and a Black Saturday survivor, so I understand greatly how much fundraising like this is needed! So, thankyou!!! As a Queenslander, may I thank you from the bottom of my heart for your compassion and generosity. Our house was safe and we only suffered loss of power for two and a half days and were cut off by flooded roads for a few days. Some of our friends were not so lucky. We are overwhelmed by the world-wide support. God bless you. Oh my goodness, what a gorgeous quilt. I bid $900. This quilt is such a generous donation. I bid $1250. Yes....I'm another Brisbane girl who owns a little shop in Balmoral Brisbane that was in the direct line for flooding. Most of the houses in the street went under but we were miraculously sparred. Your two lovely books can be found in the sewing section of my store and I think it is wonderful that you would even consider helping out those less fotunate on the other side of the world. I would like to bid $1500 for the quilt. Anna, the Make It Perfect blogspot states the auctions will close at 9pm Monday. Yours closes at midnight, right? This quilt is absolutely stunning! I congratulate you on the excellent bids and add my prayers for those affected by the flooding. Blessings to you for donating to the auction. I’d like to bid $1800. I have to admit that I didn't even know that Queensland was flooded. I love seeing the response to this auction. We know very well in the Nashville area the devestation of flooding. The current bid on the quilt is out of my range, but I will make a donation to the organization listed. Diane and all, yes I will end my auction at 12 midnight CST- thanks! Anna Maria I think what you (and so many others) are doing is so wonderful! I drive past some of the devastation that these floods have caused every day and it is simply heartbreaking to see the contents of someone's entire house emptied on the street waiting for rubbish collection. It is very heartwarming to know that there is this much care and concern from half a world away. Bless you and everyone else who is supporting the recovery effort. This is awesome! I love bidding for good causes! I'll bid at $2000. These blog auctions are awesome, and Anna Maria's offer is particularly generous. However, I wonder whether there will be a similar initiative for the flooding in Brazil which is much worse than Queensland. "Brazil’s most-deadly natural disaster prompted Rio de Janeiro state to declare an official mourning period as mudslides caused by heavy rain in the region left at least 555 people dead and 6,050 homeless, according to local news reports." The need is all around us, and our means are limited. How wonderful, I too am a follower of your blog and am an Aussie, I love the genorisity of fellow crafters. This is a great thing you have one, we all know the enormity of the damage done by these floods. Well done all!!!! this truly is so heart-warming! i am an australian, and have been in such shock at the state of our country every time natural disaster strikes us, with several friends in devastation in each circumstance, and it is so lovely to see people across the other side of the world responding so compassionately.